The Chesapeake Bay Maritime Museum’s (CBMM) Model Sailing Club has announced the dates for this year’s model skipjack sailing in St. Michaels, MD. Club members will race radio-controlled (RC) model skipjacks along CBMM’s Fogg’s Cove on May 19, June 9, July 21, August 18, and October 20. All races take place from 11am to 1pm, and are free to watch with museum admission. 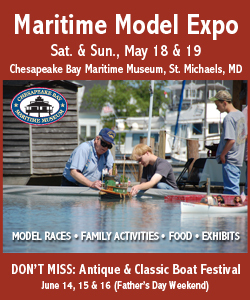 The May 19 race coincides with the Model Guild’s two-day Maritime Model Expo, which begins May 18 and includes model displays, demonstrations, family activities, and more. Built in the early twentieth century, the sail-powered skipjack was once a cost effective working boat used by watermen for oyster dredging. Today, only a few remain working on the Chesapeake Bay. The club races RC models of these two-sailed bateaux, which at full size can vary from 38 to 48 feet in length. Started in 1983 as the Saint Michaels Model Boat Club, the Model Sailing Club continues today at CBMM through its many members and volunteers. To learn more about the races, or joining the club, contact Commodore Richard Clayton at 410-745-2372. For more information about CBMM, call 410-745-2916 or visit www.cbmm.org.